American hero Commander Bliven Putnam returns to the sea to meet the deadliest threat to the United States since the Revolution. At the opening of the War of 1812, the British control the most powerful navy on earth, and Americans are again victims of piracy. Bliven Putnam, late of the Barbary War, is dispatched to Charleston to outfit and take command of a new twenty-gun brig, the USS Tempest. Prowling the South Atlantic in the Tempest, Bliven takes prizes and disrupts British merchant shipping, until he is overhauled, overmatched, and disastrously defeated by the frigate HMS Java. Taken aboard, he finds he recognizes two familiar faces from Naples: the Java's captain, Lord Arthur Kington, and his old friend, Sam Bandy, who has been pressed into British Service. As Bliven and Sam plan to foment mutiny among the captive crewmen, they cannot possibly know that another American ship looms over the horizon or that one of the most famous battles of the War of 1812 is about to begin. 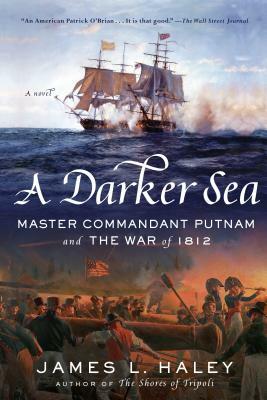 With exquisite detail and guns-blazing action, A Darker Sea illuminates an unforgettable period in American history. James L. Haley is the award-winning author of The Shores of Tripoli, as well as numerous books on Native American, Texas, and Western history, and historical and contemporary fiction. His two biographies, Sam Houston (2002) and Wolf: The Lives of Jack London (2010), each won the Spur Award from the Western Writers of America. Passionate Nation: The Epic History of Texas (2006) won the Fehrenbach Award of the Texas Historical Commission. His most recent nonfiction is Captive Paradise: A History of Hawaii (2014).